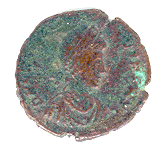 Often the easiest thing to identify on a late Roman coin is what the figure on the obverse is wearing, on its head and on its shoulders (if it has any). This guide is not meant to exhaust all the possibilities, but it does describe and illustrate the features you're most likely to encounter. Please bear in mind that this is far from being a complete survey. First, the headgear. The obverse, or "heads" side of your coin will probably show at least the neck and head, and sometimes the shoulders, of a figure. Usually the obverse figure on an ACE coin is a ruling emperor or one of his sons. 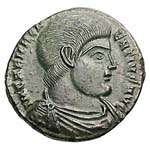 Although earlier portraits on Roman coins were sometimes shown bare-headed, almost certainly your coin will show one of several kinds of headgear. Here are the most common types. From early Republican times, "crowns" - wreaths actually - of greenery were awarded to, and worn by, those who had achieved certain glories, primarily military in nature. "Laurels" usually signified noble birth but could be awarded to any person for significant achievement. The Oak-leaf Crown, or Corona Civica, was reserved for those who had saved the lives of many fellow soldiers in battle and had held their ground throughout the battle. The Corona Graminae, or Grass Crown, was reserved for someone who had saved the lives of an entire legion or army. Crowns of differing designs were also awarded to those who displayed valor in various types of battles: the Corona Navalis for a person showing particular valor in a naval battle, the Corona Vallaris for the first soldier across the ramparts of an enemy camp, and so on. 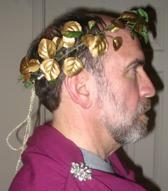 In the early days, a laurel wreath was typically the most common form of headgear seen on coins. It indicated nobility, but also a certain modesty, since anyone might be awarded one or wear one by virtue of noble birth. On a well preserved coin, you may be able to make out not only the individual laurel leaves, but also the flying ties in the back, and possibly the bow. A more worn coin, however, may be harder to read. In this example, the leaves look like a series of dashes, although you can still see the ties in the back. 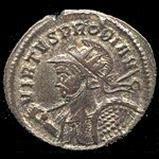 Early in the Empire, the emperor's headgear type was used to distinguish between two varieties of coins that otherwise were confusingly similar. 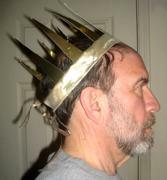 On the copper As, the emperor usually wears a laurel crown. 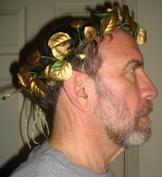 On the brass Dupondius, he is shown wearing a spiky crown similar to the classic type found in fairy-tale illustrations. This "radiate" crown -- which may also have been meant to suggest the rays of the sun -- was also later used on the Antoninianus, or double-denarius. 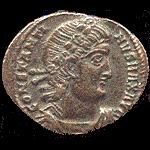 After the Antoninianus was phased out in 294, some coins continued to show the emperor in a radiate crown. These are sometimes called Antoniniani but are more correctly known as "post-reform radiates." On a well preserved coin, you will be able to see the spikes, or "rays"; the narrow band of the crown itself; and the ties in the back. Even a coin in poor condition will often preserve the telltale traces of the rays and maybe the ties too, as in this example. Even a coin in poor condition may have the remnants of dots or bumps that represent the pearls. 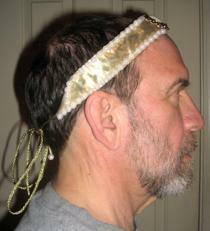 In this example, the pearls are still visible on the ties and the part of the diadem at the back of the emperor's head. 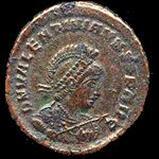 Sometimes the ruler on a Roman coin is shown wearing a helmet, suggesting his military skill and power. Some coins show the ruler "draped" in a cloak fastened with a large pin on the shoulder. 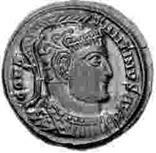 On other coins, the ruler is wearing a military breastplate, or cuirass, and is said to be "cuirassed." 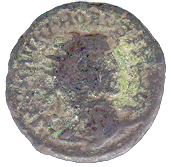 Still other coins (described as "draped and cuirassed") show the ruler with a cloak on top of a cuirass. It's often hard to distinguish the cuirass under the drapery, even with a well-preserved coin. The folds of drapery, however, are usually readable even when little else is. Here, there are still a few creases left where the folds of > the cloak are draped around the shoulders. Photos with model and images of well-worn coins, Kate Gilbert; other coin images courtesy of Doug Smith, CNG Coins, and Beast Coins.